Need stock signs for quick compliance? Visit www.ADASIGNAGE.com to buy online. Please click here to see our FEATURED PRODUCT: ADA sign setter tool. Our exclusive sign setter tool features a non-warping solid aluminum post, yet weighs only 1.8 pounds! Cuts installation time dramatically. Welcome to ADAsigns.com. 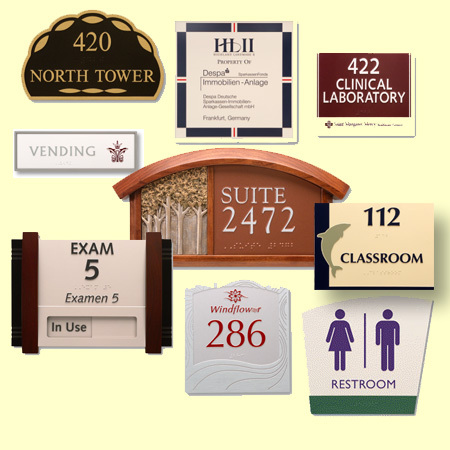 We produce architect and designer specified way-finding signage, with an emphasis on ADA compliance. Whether you're 3,000 miles away or nearby, you will receive the same high level of personal service and attention to detail - in fact, this is the same concept that enables us to effectively produce and ship our ADA products on a national basis. Modern design and production capabilities enable us to manufacture exactly to your specifications. 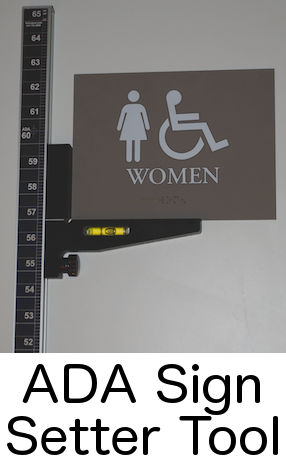 We work directly with end users to arrive at the right solution for your ADA sign compliance requirements. Architects, property managers, design firms, contractors and many others rely on us for developing as well as maintaining their existing ADA sign programs. Our distribution network is national, though we ship our products internationally as well. ADA signs are available in many forms, and on a variety of substrates, depending on your need and the application. For details and specifications, see the menu on the left and click to open the item of your choice. Thank you for your interest in ADASigns.com....we look forward to working together with you soon! *If you are looking for stock ADA signage, please visit ADAsignage.com where these products may be purchased online. Please contact us for professional compliance and design consultation - we're here to help! ï¿½ 2011 Copyright by ADASIGNS.COM / a division and website of Recognition Corporation - All Rights Reserved.